"I’m not a street artist, but I find that working on the street is like a live performance. I do murals because, for me, they are like a live gig and I really enjoy them." Studio 75 is an exciting renegade and social action art project in oh so trendy Dalston. It is the brainchild of artist Naz Tanbouli, and his wife, Gillian McIver. 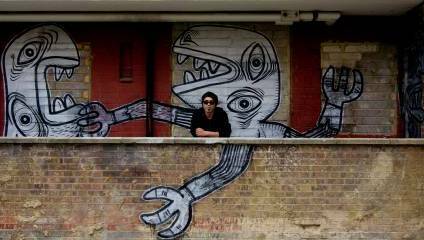 Naz has worked on a number of interesting projects with the local community, such as the Kingsland Estate mural, that was featured on the BBC and his legendary ‘Open Studios’. London Calling’s Katie Moritz spent a fascinating half an hour with Naz and tapped his genius. So tell us the history of Studio 75? The story started in January 2011 when we got this flat, to use it as a community space. It didn’t look like it does now. We spent about £400 sorting it out and we transformed it, it’s much cleaner now, especially the floor! The most important thing is that the flat was rent-free. So with the rent off our back, we found a fantastic place to display and exhibit all the kind of art and film that we stand for. We wanted to make socially accessible and acceptable art and use the place as some sort of creative hub. And involve all of our talented, marginalised friends all over the planet, this doesn’t cost any money. Well done on winning your recent award, tell us about it? Thank you! The Creative Enterprise Award is an annual award, given by the University of the Arts, to students who have some sort of professional development after graduation. We submitted the Kingsland project for Studio 75 as an enterprising project. Although the award is always given to a project that makes financial success, we were awarded for the opposite reason, achieving success on zero finance. The ceremony at the BFI was lots of fun! Tell us more about the Kingsland Estate project and the great coverage that it got? The Kingsland project started on the doors of the studio. We wanted to make something that looks attractive on the Kingsland Estate, without spending any money on the place - to tell people that there are some activities going on here, to make them curious. I painted the entrance of the studio, which was quite interesting, because it’s a big entrance for a very small thing! Many of the neighbours started to express their desire to have more, because it broke the grain a little bit and gave a hopeful vibe. I did it when it was cold and grey, so putting yellow on the walls really excited people. I did fourteen buildings over the course of four months all by myself, most of it taking place in a wet summer, which was quite a challenge! I had serious fun. I’m not a street artist, but I find that working on the street is like a live performance. I do murals because, for me, they are like a live gig and I really enjoy them. The BBC and Time Out covered the story and we got great coverage in the online publications, like the Londonist, Global Street Art London and Spitalfields life. What is it like being an Egyptian, living in London? The interesting thing about London is that there are plenty of non-English people there’s a very big mix, especially on the art scene. This gives London a multicultural take. It doesn’t feel as alien in London as it does in other places in England. Everybody is from somewhere in London. The thing about London that I’m working towards changing is the complete commerciality of the capital. It can feel like if you’re not producing money then it’s not important, and if you haven’t got money, then you’re not important. London as a dominant financial capital is good for all of us, but this kind of capital is eating all the other activities, especially the cultural ones. How do you work with the local community? When we got this place we needed to go casual. No proposals, no applications, no interviews, it’s about direct contact with people. The other important thing for me is the receiving end of art - the audience. When we work here we’re not actually artists in residence, we are residents, we live here. In a time of crisis a nurse tries to save a life, or a fireman helps, as an artist we live here and we have a social duty to help. The thing we can help with is art. We just had a film screening here of the film by the Wales-based filmmaker, Glenn Ibbitson, who’s also a painter and has exhibited here. Last year we did the show here at Studio 75 for Photomonth, but this time I thought it would be quite good to do it in a film school. There are all kinds of different pictures from filmmakers all over the world. We’re open to suggestions to projects, particularly mural projects. We’re quite happy to cover all of London with murals if the opportunity arose! We’ve done some publications and we’re looking to do more both online and with books - artist books, graphic novels, things like that. After making a lot of shows and open studios, collaborations and events, I'm going to take on another marathon. Starting on December 15, over ten weeks, I'll mount ten completely different exhibitions of different work that I've made over the past two years in the studio. Drawing, painting, book art and so on. Meanwhile I'm also showing all month at Hackney Downs Studios, an exhibition called The Wall. The most important thing we want to put out there is that we are going to lose this space in two months time. If there is anyone interested in providing us with a derelict place – an empty flat or garage - to use as the next studio, then give us a shout!